This has held up very well after multiple washing. Update the look of your bedroom with the Superior 300 Thread Count Cotton Sateen Stripe 15-inch Drop Bedskirt. 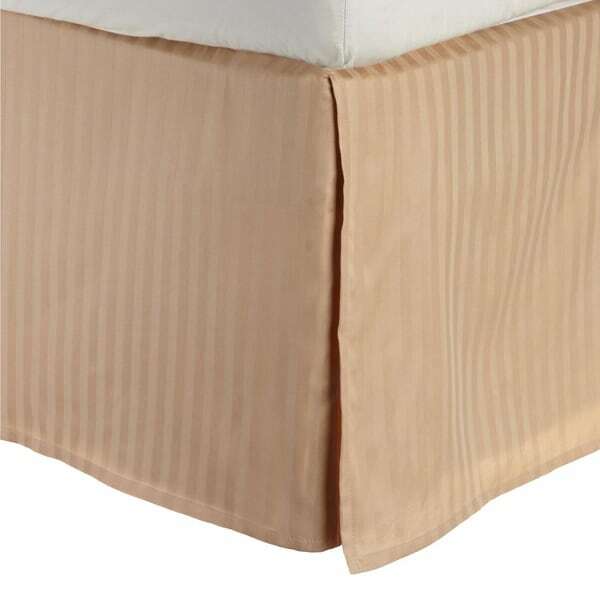 This bedskirt features a 300 thread count cotton construction with a flat design and a stripe pattern that is available in a variety of colors. Great buy on a lovely bedskirt! I have looked and looked for a bedskirt with a 15" drop. I was so happy to find this one, which is so reasonably priced. I ordered the gold one for my guest room and it looks great with the comforter I have. I'm signing on again today to buy the light blue one for my master bedroom. I didn't wash the bedskirt prior to putting it on the bed, but I did iron it and it ironed well. I'm quite pleased, especially given the price. This was my first purchase from Overstock.com. nice bedskirt and is as appears although it could have been about an inch longer. Also it doesn't quite fit the size of the mattress. It is a little short and I have a standard queen. I have had many positive purchases with O.com this bed ruffle was not one that I was happy with. I purchased this bed skirt to go with a quilt set I purchased at O.com the same day. Because the photo of the quilt set was not the same colors that were actually in quilt I received the bed ruffle and it did not match at all. I explained this for my reason for return. I was still charged for the shipping to and $$$ for shipping back. Just thought because of the bad description in photo they would not require me to pay return postage as I did not even open the bedskirt kept the quilt set even though the colors were not even close to the photo they showed. I will definately think twice before ordering as that return is one I do not agree that I should have been charged return postage. If the colors were close I would have been ok with it but the colors were at least three shades off the actual color and i opened it in several different monitors to make sure it was not my ipad or computer screen. I bought this to go with the Egyptian Cotton 400 Thread Count Striped 3-piece Duvet Cover Set. The stripes are the same size as the duvet set so they are very compatible. The fabric is nice quality, including the deck of the bed skirt. I chose the burgundy skirt, which looks very nice with the grey duvet set. Good value for a bedskirt. Bedskirt is as advertised - the color, size and quality. No surprises and that makes me happy. I thought the color was true to the picture, but for the thread count I thought the material was too thin, but for the price I would recommend this product. Lovely fabric, with a soft feel and a pleasing, subtle stripe. Box pleats add to the expensive look. High-quality construction, the top layer (which is hidden between mattress and box spring) is a sturdy cotton or cotton blend fabric that won't tear easily, unlike many others I've owned. Highly recommended. This is a great product - just as advertised. It fits my mattress perfectly and looks great. While it is a bit thin, you can't really tell unless you are up close up. It covers up my bedframe and that's all I really wanted it to do. Matches beautifully with another taupe sheet set I purchased. A great value and high quality. Definitely would purchase again! Matches the coverlet that we also got. Very nice. Hangs unevenly and looks cheap. Not right for me, had to send back. This bedskirt looks nice but it isn't sewn well. The material pulled away from the skirt fabric within a couple of days. I would not recommend this bedskirt. I recently renovated an older home to put on Airbnb for extra income. It's difficult to find bed skirts these days...especially straight cut fitted ones...not the old fashioned frilly type. These worked out great. The bedskirt still looks super pretty with pale sheets and cottage-style colors in the bedroom. The bed looks so much more finished with a bedskirt. This bedskirt look good, fits correctly and easy to clean. I recommend it! Beautiful and well made, true to color shown on line. So pretty with the quilt sets I had gotten as well. Will be returning. Can see through it and unable to get wrinkles out for it to lay nicely. Too thin. The Simple Elegance Cotton 300 Thread Count 15 inch Drop Striped Flat Bed skirt does feature split corners. "Does this bed skirt have any pleats?" Only on the corners. Good quality and fits well. "Your answers to this question are confusing. Are the corners split or not? Thx!" Hello Sue T., this has split corners. Thanks for shopping with us! "Does the bed skirt cover all four sides of the bed?" Thank you for your question, LRT. Yes, the Egyptian Cotton 300 Thread Count Striped 15 in. Drop Flat Bedskirt covers all four sides of the bed. Have a great day. Hello LRT, per a large number of customer reviews, it appears that this bed skirt will cover all four sides of the bed, however one customer measured the length of the drop, and claims it fell a little short. I hope this information is helpful. Thank you for shopping with us! Overstock says these skirts have drops on all four sides but that is not accurate, they only have drops on the side and the foot, just 3 sides. "Is this a "wrap around" bed skirt or do I need to lift the entire mattress to put it into place?" Thank you for contacting us leslieileen. No, it is not a wrap around. You will have to lift the mattress in order to place the bed skirt on your bed. Please let us know if you have any further questions. "I also want to know if this has split corners. I don't think the answer provided gives the information I am looking for. I want to know if I can use this with a poster bed frame." Hello, findell. Hope your day is going well. Yes, this item has split corners and can be used on a poster bed frame. It will go over the bed frame. Thank you for shopping with us and please feel free to contact us again with any further questions.